If your colony made it thru the winter and is packed with bees. You have to divide. If you don't divide your hive will more than likely swarm. 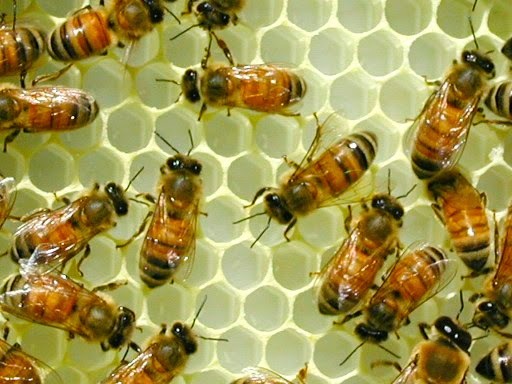 When the bees swarm, that hive usually produces no honey. All the field bees leave and it takes them weeks to recover. Nature's Nectar LLC does buy divides. Call us if you want to sell your divides. This link explains the easy way to do a divide from Gary Reuter's web page. I talked to my Bee Supplier today. I should have queens for sale starting Thursday April 30th. Marked and Unmarked, Carniolan and Italians. I have had a couple reports of beekeepers finding all their bees fallen to the bottom board. What has happened is the sun has warmed one side of their hive and the bees have migrated over to the side that is warm. This pulls them off the feeder pail. They are fine for a day or so. But after that they run out of food that was stored in their stomachs. With the cold week and some cold mornings the bees start to starve because they can't reach the feeder pail because they are clustering off to the side of the hive. If you see your bees in this condition look at the clump of bees and see if they are moving at all, move the hive to a warm vehicle or garage. Lightly spray some sugar water on the clump. 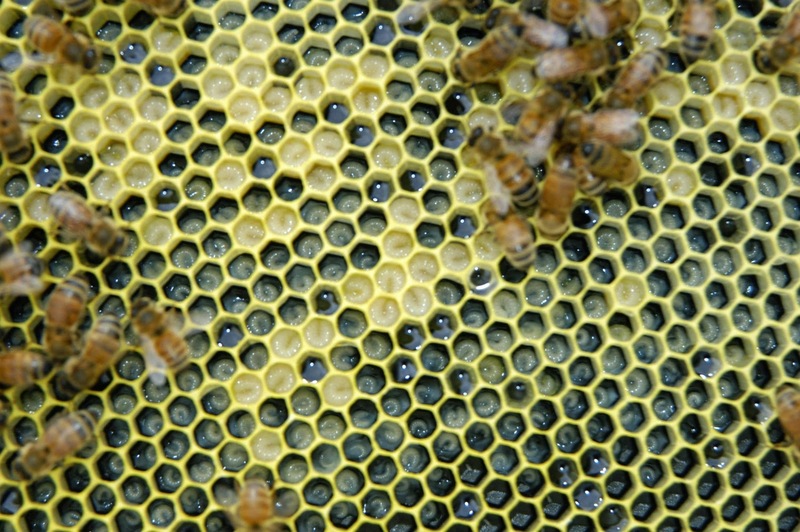 Move the clump a little with your hive tool and lightly spray the bees underneath. They may or may not come back. If they come back, watch where the cluster is and take out frames away from the cluster and slide the frames with the bees on them under the feeder pail. Put the other frames back in. Hindsight to this is, if a beekeeper started their package bees in a five frame nuc box the bees would always be on the feed and the bees would be alive today. The beekeepers on our second delivery, if you have not checked for queen acceptance yet, you need to do it now. Watch the video in the previous post. The check can be done in 30 seconds and then close the hive. 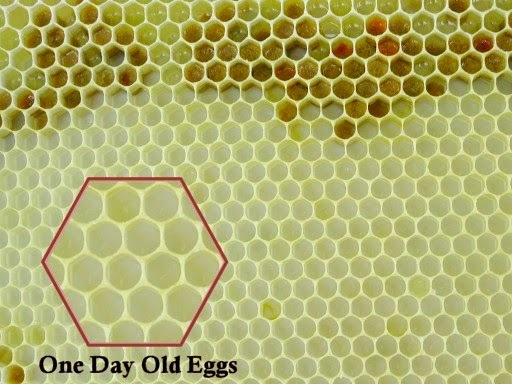 By now there should be eggs and maybe larvae in the cells and they will be very easy to see. If you see eggs and or larvae you are good. Close up the hive right away. Failure to check for queen acceptance and the queen was not accepted, will with time, turn the bees to laying workers. Once a package has turned to laying workers it is more or less doomed to failure. It is time to check for queen acceptance. A quick check to see if the queen has been accepted is very important for colony survival. If the queen has not been accepted a new queen has to be installed as soon as possible. 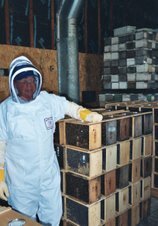 Any new beekeepers that bought their hives online or from a local farm supply and were given entrance feeders to feed their colony. Entrance feeders are feeders that are on the bottom board at the entrance reducer. With this cold weather coming your hive is in very real peril of dying. The bees will not be able to get to the feeder because they will be clustered at the top of the box and will not go down to the feeder. They will starve to death. Get a new feeder today. The bees are in and are ready to be picked up. There is no cage exchange and cages will not be accepted. We will be here until 7 pm tonight. Today is first come first served. Tomorrow, Saturday we will follow the delivery schedule posted below. The bees are on schedule. They should be here sometime on Friday. Friday pick up is first come first served. We will go by the first initial of your last name. Please try to follow the schedule. The wait time for bees will be usually no more than five minutes. If you are traveling more than 100 miles, please come when you have to. The first delivery came with a little shakey start of weather in the Rockies and snow on the road. The driver waited a little longer and his ride ended up smooth with no problems. It was cool all the way to Minnesota. The bees looked in great shape. Due to the cool weather the feeder cans were still heavy with feed. When it is hot in route, the bees will consume more feed. Thanks to all my helpers that made these two days possible. The wait time for bees was usually no more than three to five minutes. Also, thanks to all the beekeepers that followed the pick up schedule. That really made the bee pick up stay at a fast clip with minimum wait times. Package Bee Pick up Schedule April 11th.